Mini biking on a 50cc moto. 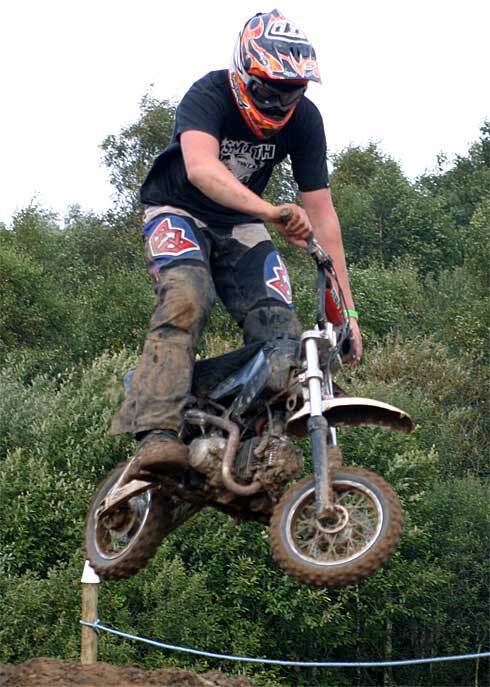 50cc mini dirt bikes are suitable for beginners in the world of motocross bikes. The 50cc engine is light yet durable for those wanting to get to grips with this activity but not have a heavy and cumbersome motorbike. You’ll be surprised at how much power this type of engine has and should last a long time if you don’t abuse it unnecessarily. The mini dirt bike is now a popular bike and is ideal in all weather conditions. With numerous 50cc mini dirt bikes on the market, it’s a wonder what to get. Of course there are tons of mx dirt bikes for sale, so why go for the 50cc? Well they are light bike dirt mini moto's, and ideal for kids - but dont tell that to the adults that love them as well. Dirt and mini bikes have been developed a lot since only a few years ago and can be very well spec'd not just powerful small engine units but gas mini dirt bikes too! We'll start with a great 50cc mini dirt bikes model, the Cobra 50 - YAMAHA (blue), ideal for 2009, and it looks the part. And here’s what we have - Upside front forks and adjustable rear shock, extended arm and a big bore exhaust. Lots of safety features too with rocker style kill switch, restricted throttle, enclosed chain and stronger brake levers. This all adds to the durability of the bike of course. Big 10 Inch tuff wheels and attached to em' is wavy disc brakes. Not too mention it looks awesome with amazing graphics. This will be a big seller. Also we have seen another ride that can go in the fast dirt bikes category. This is the COBRA 50 - KTM. Similar to the Yamaha with YZF Style Plastics, brand new design in the frame plus all the safety of the Yamaha. Both bikes have super grip tyres that give the oversized dirt bikes mini tyres the stick-ability these rides need. Looks as good as the Yamaha, and with the low gearing will give the rider instant power - Full length is 112cm and seat height is 58cm . 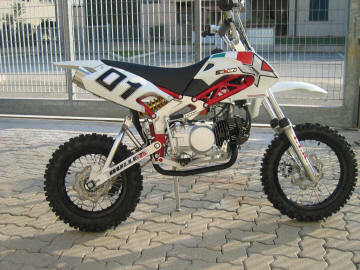 Another neat 50cc mini dirt bikes model - ideal for children is the KXD 50R - 50cc. This has an auto electric start - so very easy to use. Because its gentle power feed is much slower, your child should feel at home on this bike in a short time. A mini moto dirt bike, which still retains the look of an adult dirtbike with chunky tyres and good dimensions - so no mini-bike crunched up riding, dimensions are - Seat height to ground 56cm - Seat height to footpegs 36cm and wheelbase 82cm. The advantage for dad is that it's quite low maintained and can take a weighty rider. Good chunky tyres, throttle restrictor, disk brakes and Safety Chain Guard. Depending on personal choice either a rev-and-go electric start or a pull-start is fine. The best front/rear shocks you can find and a kill switch fitted. Have your child ride the fast mini dirt bike moto, to see IF they can reach the pedals and handlebars without dis-comfort. If they can handle the power and your happy the engine and bike isn’t going to need serious mechanical attention, then its a winner. Finally be sure the 50cc mini dirt bikes that you buy arn’t too exotic and mini dirt bike parts can be bought from your local store. If your buying a used mini motor cycle then be even more picky - you might get some cash knocked off. Bargain hard, and if the seller has a tool kit, manuals and spares for the bike lying about, make them an offer - they might even throw them in - if you meet the seller’s price. Its worth asking. 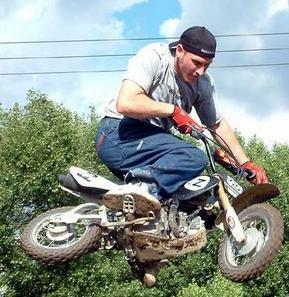 When purchasing your 50cc dirt bike mini cycle, have a list of your requirements ready. A 50cc mini bike buy should be fully complete and looked after. You can buy a well ridden pocket bike 50cc cheaply, but you will have repair bills ahead of you. When you can; buy your 50cc mini bike with as much paperwork and receipts as possible and pour over any mini dirtbike pictures in the 50cc pit bike advert. You can then ask questions on any missing detail.